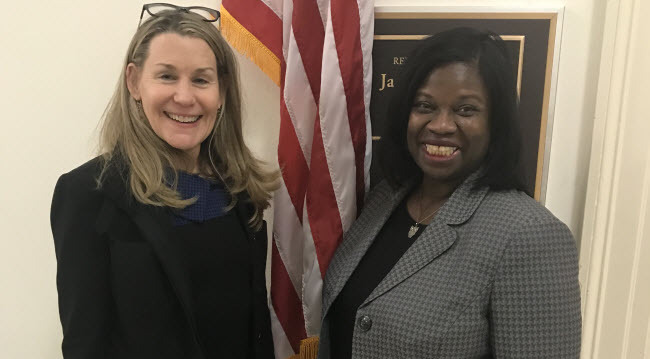 Last week, Mary Rasenberger and Cheryl Davis, the Guild’s Executive Director and General Counsel, visited Capitol Hill with a dozen other members of the Copyright Alliance to advocate for the passage of the Copyright Alternative in Small-Claims Enforcement Act of 2017, known as the CASE Act. The CASE Act would create a copyright small-claims court and give individual creators and other small copyright owners the ability to enforce their rights without hiring a lawyer or going to federal court. Since even relatively simple copyright cases can cost more than $200,000 in legal fees, the creation of the small-claims tribunal could effectively place copyright remedies for the first time within the grasp of an entire class of creators who otherwise could not afford to pursue them. As previously reported, the bill was reintroduced this fall by a bipartisan group of members of the House Judiciary, led by Rep. Hakeem Jeffries (D-NY). The purpose of the visits was to seek support from other members of the Judiciary committee; the more sponsors of the bill, the easier it will be to move it to the House floor. Over the course of two days, sometimes splitting up, the group met with the offices of Reps. Chabot (R-OH), Jordan (R-OH), Franks (R-AZ), Deutch (D-FL), Labrador (R-ID), Cohen (D-TN), Poe (R-TX), Gohmert (R-TX), Goodlatte (R-VA), Raskin (D-MD), Issa (R-CA), and Cicilline (D-RI). The Representatives and their staff that we met with were all interested and potentially supportive of the bill; they asked insightful questions about the bill and how the tribunal would work. The Guild supports this bill because far too many of our members have had the experience of not being able to protect their copyrights from even the clearest cases of infringement due to the high costs of litigation. That means that authors, like other creators and small copyright owners, have had a right without a remedy. The small-claims tribunal would allow copyright holders to bring copyright actions without having to hire an attorney. Proceedings would be conducted remotely so that claimants do not have to travel. Damages in such cases would be limited to $15,000 per act of infringement with a $30,000 maximum; meaning that it won’t be available in cases where an author seeks higher damages; and there would be no injunctive relief. It will nevertheless provide a forum for many infringements of writers’ works, including articles and excerpts. While a small-claims tribunal would not fix all the problems in the current system of copyright enforcement, it is a step in the right direction. The Guild will continue to monitor the progress of the bill, and will continue to lobby in support of it.